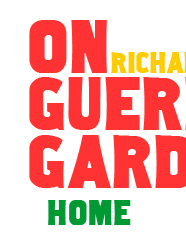 Reviews of On Guerrilla Gardening by Richard Reynolds published by Bloomsbury in the UK, Orange Press in Germany, Les Editions Yves Michel in France and Dulnyouk in South Korea. "Reynolds has done more to inspire planting in public spaces than anybody since the sixteenth-century Diggers"
"This lovely book is both a celebration of the international movement’s recent history, and a how-to manual that advises on hardy species, planting techniques and social engineering." The Guardian, 24 May 2008. "The best book on the subject so far." Powell's Books, 27 May 2008. Reading this book is one of the Sunday Times Style's "50 hottest things to do this summer." 27 April 2008. "His is a libertarian approach that, as a thought leader, he should be commended for. Certainly anyone who can span the diverse opinions, motivations, and concerns of guerrilla gardeners worldwide deserves a medal." Groundswell 30 May 2008.